As an illustrator, I have kept over 50 sketchbooks–and now my approach has been influenced by my experiences with landscape and film. This class builds upon my thesis and suggests methodologies for collecting data and seeing and experiencing landscape. 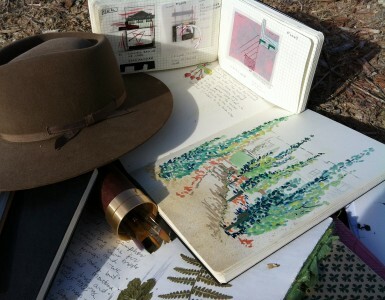 Animated Field Books is designed for many levels: the visual artist, the landscape architect, the architect, the illustrator and the graphic designer. This class is open to those who seek to be more expressive with drawing and establish a practice that includes drawing in the field. The class will be introduced to reflective field practices and processes. To experience this class, click on the link above.